My 6 year old son Isaiah is in love with the movie "Box Trolls". 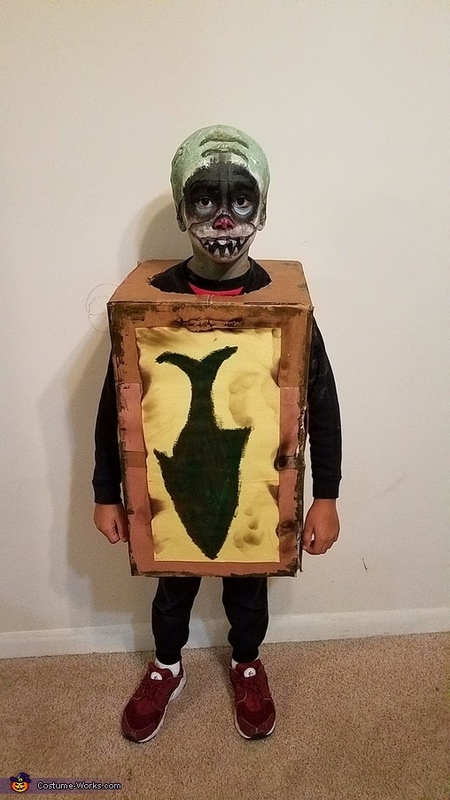 To make his dreams come true for Halloween I made his costume to mimic the character "fish" as well as I could. I found two boxes and fused them together using masking tape. Lots of it! I then took box color/brown construction paper and covered the box to make it look uniform. I took yellow construction paper and put it in the front where he would be facing front. I cut the bottom out of the boxes so my son could slip in from the bottom. Two holes for his arms on each side and one hole on the top for his head. I burned the yellow constructions paper's borders and pieces of it to make it look "worn in" I painted the borders of the box with a dark brown and pieces of the middle to give it a "worn in" look. I painted a fish on the yellow construction paper to mimic the characters box. I used green, white, and black face paint to paint his face. I took Suran wrap and wrapped the top of his head...then used masking tape to tape it all down. I taped over the Suran wrap so I could paint over it later on to give him a bald look. I painted his face and top of his head using green and white.i contoured some ears on the side of his head creating a 3d look using the bottom of his own ears as a guide. I then used a pink lipstick to make his nose. I stick glued his eyebrows down and painted over them to give the illusion of no eyebrows. I would mix white and green for light green and black and green for darker green to give him lots of dimension and life to his face. I painted over his lips and made an illusion of a bigger open mouth by painting on teeth as well. All in all I spent $23 . He used all black clothing underneath his box he already had in his closet.